Update: Google announced rich snippets in SERPs which will use Microformats and RDFa markup data. Microformats will set a new SEO trend for local search as geo targeting will be more and more important. Last week, we had a special session at Flip media on Semantic naming convention by Praveen Vijayan and Jaison James. It was all about naming the class or id we use while building HTML for websites. The session was successful by all meaning and we created a list of common name we should use in future projects. Hopefully, we will be using that standard naming convention in our future projects once it is approved by the core team. But as an SEO who is looking somewhat on future, I decided to look into those names with eye of SEO. Everyone knows that semantic html means a name understandable for a man from Mars. When coming to search engines, they know that <h1> is more important than <h5> and each and every one is using those tags believing that Google respect <h1> than <h6>. Also, the <address> tag is always used for printing address information on websites. These all are the old stuffs. In last December I announced that I am preparing new stuff on Microformats, the new generation semantic html. But I didn’t talk about it later. Any ways, I did a presentation on the same at Flip media. While doing those studies, I notices that Operator extension for Firefox is capable of understanding values identified by class names. For example if the class is “adr” that mean it contains address information. As Microformats is being world widely adapted, Google would open an eye on it. Especially Google local business search is highly bounded with “geo” Microformats, Google will be capable of identifying content type from class names of the container element. What will Google do on this ? Keeping the theory of develop for human first and robots second, Google will not ask you to use a defined class name for your each element. But Google will analyze some websites and will make their own decision on which named classes contains what kind of information. For example, a container div with class header always contains corporate information (logo) and main navigation information (probably). The part next to it is container div with class content, which is the important part of the page. 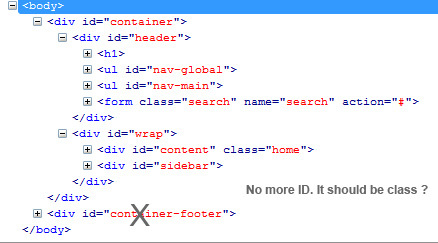 At the end, the footer div comes with more or less site links and copyright information. Did I forget the class name highlight which is used for highlighting the content among the page? This is all about semantic (meaning full) naming convention to be used and being used by 45% of websites. So keep in mind that to use class names like following. Otherwise, your site is not identified accurately in future. But the last week’s session by Aneesh and Vinod Kumar on CSS Frameworks gave me a nightmare over these thoughts. The pre defined class names used by frameworks including YUI are no ways semantic and I don’t think Google would ignore websites using YUI CSS framework. There are many factors now influence SEO beyond HTML classes such as advanced link building and off-site factors like link popularity and social media popularity. In very near future, Google will identify content in the page using Class names. So be prepared with semantic class names in your websites. And if you are using any CSS Frameworks, you should put some Meta content in your head to make Google understand about it.